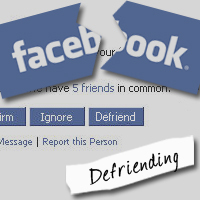 To de-friend, or not to de-friend? We’ve all had those moments, the time when our finger hovers over the mouse, mind ticking away, ‘should I or shouldn’t I?’ To de-friend, or not to de-friend? That is the question. When does it become okay to tell a Facebook friend we no longer want them to be part of our digital social life? What will happen to our offline friendship with that person? You know, the friendship forged 20 years ago in school, or university, that shone so brightly for a few years before dwindling to occasional Christmas cards and accidental shopping mall bump-intos? The same one that suddenly reignited in a flurry of comments, shared pictures, funny wall posts, travel anecdotes and occasional political slanging matches thanks to the shared discovery of each other on Facebook? But now, the love affair is dwindling. The posts no longer work for you. Their strong views on politics, religion, gay marriage and the rest suddenly jar with your own views, and you’ve found yourself clashing repeatedly. But to de-friend? Surely it hasn’t come to this? This is an issue increasingly faced by social media users every day. What will happen if I de-friend someone I’ve been friends with since, well, since I first set up my online profiles? Will they hate me? Will the rest of my Facebook friends notice? Will I in turn be shunned? Will the next school reunion see me exiled to the table with the kids from the brass section? This was the question I faced recently when a rekindled school friendship became a social media drag on me. What started innocently enough, old friends from school connecting online sharing images, posts and warm memories, soon became something else entirely. Suddenly I found my views on the world being not only challenged, but attacked, vehemently. Okay, I’ll admit it. From time to time, I post a comment or two designed to provoke a reaction, to get people talking, but most importantly, to get people thinking. It’s interesting to see the various views a post on immigration, the government’s performance and so on will engender. And for the most part it’s harmless. And as a journalist I’m aware of the need to be very careful in how I phrase such posts. The idea is to provoke debate, not cause offence. But no matter how carefully worded my posts, a small group within my 380 or so Facebook friends would immediately jump to the attack. Like excited jackals they’d rip my views to pieces, accuse me of being naive, offensive, ignorant or in some cases, an outright idiot for daring to hold views opposing their own. No matter how considered my response, this one group would carry on the attack until I either deleted the post, or conceded I was actually the worst person who had ever lived on the face of the earth before skulking away. Suddenly, I found myself self-censoring. I wouldn’t dare post a comment on a government policy failure for fear this group would laugh me down, or worse. If an item on the evening news shocked me, I’d have to hold my tongue. Even when I supported the same cause as this group, I had to be ultra careful how I phrased it for fear they’d immediately misconstrue my words. In short, I was being silenced by a faction within my own group of friends. The final straw came one night when a post by one of these friends offended me greatly. I’m not particularly religious, but my wife is Catholic. When I read a post in which the phrase “the silent majority of Catholics support child rapists as their leaders” I knew the friendship was over. When I pointed out how offensive this post was, the same tired old group got their battle axes out again and went to war against me, accusing me of supporting child abusers, being anti-Muslim (I had pointed out the post was as offensive and ignorant as if I’d said ‘all Muslims are terrorists’), and being broadly offensive for defending a ‘corrupt religion’. But it wasn’t until the next morning that I had my ‘ah-hah!’ moment. I realised as I re-read over the conversation thread that I didn’t know these people at all … and they certainly didn’t know or respect me. I wasn’t allowed to be offended, even when they were being clearly offensive. I wasn’t allowed to defend something I held dear, despite such a vile attack. Suddenly, it dawned on me. Who, exactly were these people I hadn’t actually laid eyes on in 20 years, but who had free access to everything I ever posted on Facebook, Twitter and elsewhere? Why had I invited them into my life, to see my happy moments and sad, to share my highs and lows? Why did I allow them to attack my every viewpoint, even my way of expressing myself, just because it was different to theirs? And in that moment came the satisfying realisation that I could simply un-invite them from my life. De-friend, with a happy click of the mouse. Who cares if I sit at the table with the brass section? After all, it’s my life, and my social media profile. I am the dictator they accused me of being after they realised I’d de-friended them. And so what? This is my world, not theirs. There’s no democracy in social media. I’m not forced to accept you as my friend. I choose to. And if you offend me, well, then I choose to say goodbye. My advice to others who have faced the question of de-friending is this: Social media is whatever you choose it to be, with whomever you choose to share it with. If someone is bullying you, or annoying you, just de-friend them. Out of 380 or so Facebook friends, I could count on two hands the people I actually physically see on a regular basis. That doesn’t mean the others aren’t important to me, it just means that if it turns sour, I’ll probably never have to bump into them face-to-face for it to ever be physically awkward, so why worry? De-friend my friends, or not … it’s up to you. Jay your actions are not just a clear example of the cowardice that was referred to in our debate but gee mate if you want to call yourself a journalist stop misquoting to push your own barrow. You walked from a debate because you failed.to change opinions others merelt tried to remove your blinkers. As you can see, Darryn was one of those de-friended, and can’t seem to get the message. I have never cared who ‘wins’ or ‘loses’, I do care about the offensive attitudes of those who demand compliance with no views but their own. And I do care about being abused, which seems to mean I’m a ‘coward’. Darryn, get the message mate, it’s my world and you’re no longer part of it. Your comment again only highlights my point. By the way, I had to approve Darryn’s comment on this post, so I’m not afraid of opposing opinions and the rights of others to draw their own conclusions. Crikey…Daz is pretty keen to keep bangin’ the drum, isn’t he? And Jay, Daz has just proven your point about people who want to keep on the attack when you’re clearly not being offensive. To the Daz’s of the world…*un-friend*!